Cricket is played on turf pitches, using rolled and closely mown grass in strips c.22 yards (c.20 metres) long. In the first decades after Glamorgan CCC’s formation in 1888, the same pitch would be used many times over the season. The wear and tear would inevitably affect the velocity and deflection of the ball as it sped towards the batsman. The modern professional game demands greater consistency. 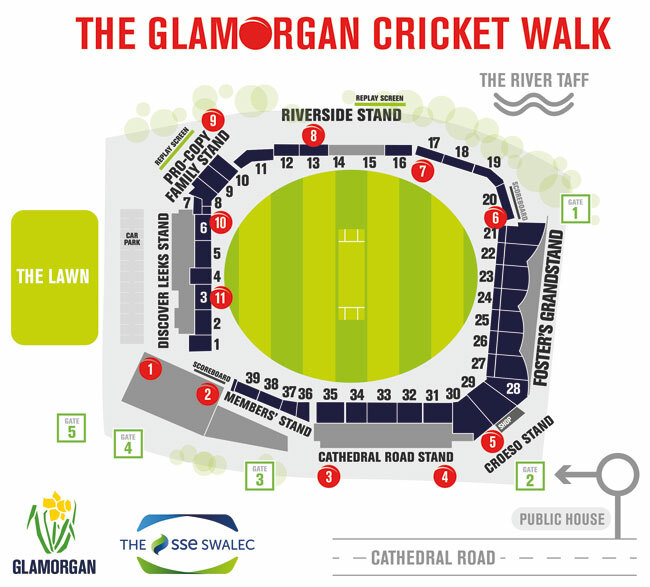 At The SSE SWALEC there are 30 pitches, of which 20 are used for professional games and 10 for practice. The distance from the Pavilion on one side of the field to the Grandstand opposite is c.200 metres. A team of four full-time ground staff tends the playing area and the outdoor practice area behind the Pavilion, with an additional six for major matches. The outfield grass is mown twice each match day, taking the ground staff two hours each time. The staff start to prepare the pitch c.12 days before a match. On the morning of the match, the pitch is given its final cut and roll before the markings are painted in white, red or blue to denote the positions of the wickets and creases (area around each wicket). The QR codes for this page are at position no 6 (shown in red) on the map below.